Click on photo to open "album" - Then click on individual photo to enlarge, read details and leave a comment. Burials: Oscar A. Anderson; Charles Anderson; Inca Anderson; Magnus *Jonasson (b. b. 1807, d. July 5, 1872 -no stone); M. *Jonasson (b. 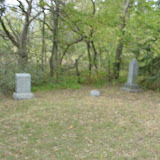 1795, died May 6, 1877 -no stone); Albert Andersn; Carl Anderson. *May be other JONASSON family buried there.